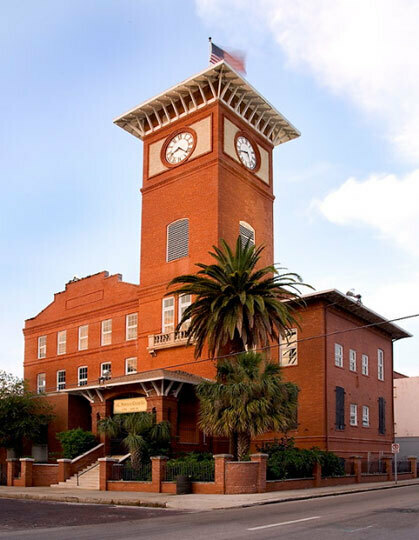 At the J.C. Newman Cigar factory in Tampa, dozens of workers operate machines that churn out 13 cigars a minute. President Eric Newman says the higher tax will increase his prices by a third and drive down business. Roberto Ramirez, who runs La Herencia de Cuba in Tampa, has been making cigars for more than half a century. Ramirez says the higher tax will hurt the industry. "Everything here is too expensive," he says. "Our tobacco, our rents, our payroll — everything is very high." 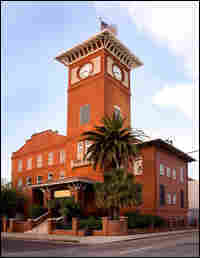 You can still find Cuban immigrants hand-rolling cigars in the storefronts of Ybor City, the section of Tampa, Fla., named after a Havana cigar manufacturer. 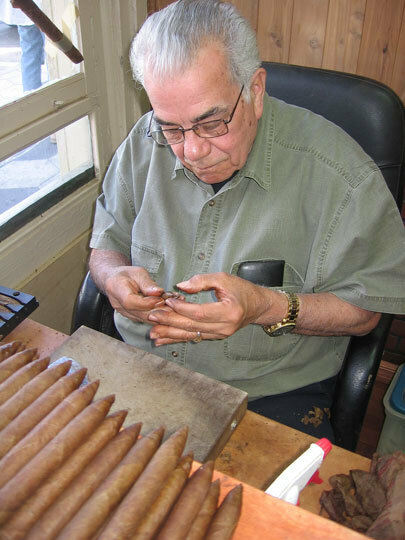 At La Herencia de Cuba, Roberto Ramirez is rolling a tobacco leaf wrapper around a torpedo-shaped cigar. His fingers are stained from more than half a century of cigar-making. Ramirez and his son, Abraham, run the Tampa smoke shop. They're also wholesalers and are bracing for the largest single increase in the federal tobacco tax, which takes effect April 1. The tax will help Congress pay for a $33 billion expansion of the State Children's Health Insurance Program. Cigarette taxes will go from 39 cents to $1.01 per pack, while the tax on cigars will go from a nickel to 40 cents per cigar. That has cigar-makers up in arms. Ramirez says he supports a higher tax on imports, but says 40 cents is too much for cigars made in the U.S. "To the industry here, it's going to kill us, because everything here is too expensive," he says. "Our tobacco, our rents, our payroll — everything is very high." Tampa was once called the "cigar capital of the world." The city's proximity to Havana and its humid climate made it ideal for producing cigars. Cigar City magazine editor Manny Leto says the industry was a force here from the late 1800s until World War II. "At its peak in the 1920s, there were more or less 100 to 200 cigar factories operating in Tampa at any one time," he says. But after a series of setbacks, including the rise of cigarettes and the Cuban embargo, now only a few remain. At the three-story, red brick J.C. Newman Cigar factory, President Eric Newman runs the company his grandfather started in 1895. On the floor, dozens of workers operate machines that churn out 13 cigars a minute. Newman says the higher tax will increase his prices by a third and drive down business. He's worried that he might have to cut his work force. "This is our life. Shame on Congress, shame on our government for trying to put us out of business. In the days they are offering $25 billion bailouts, we don't want a 25-cent bailout. We just want the government to leave us alone to run our business the same way we've been doing it for 114 years." Newman, chairman of the Cigar Association of America, says more than two-thirds of the cigars sold in the U.S. are either made in Florida or imported through the state. He calls it a homegrown industry, just like citrus. That made supporting the tax increase a difficult vote for Rep. Kathy Castor, a Democrat who represents Tampa. "I was very concerned when it started off in the U.S. Senate at $10 and then $5 a cigar." But she says the 40-cent compromise is worth it to expand children's health coverage. "Eventually it worked out because the overriding issue and concern is that children can see the doctor and get the health care they need." But retailers say the tax increase could not have come at a worse time. At Metropolitan Cigars in Ybor City, Cathy Sanchez says the tax will be a strain. She says business is already down about 15 percent. Customer Pat Collier of Zephyrhills, Fla., calls it a punitive tax aimed at smokers. "This is really just like the tea tax in the Revolution." But down the street at the King Corona Tobacco Bar, Hassan Maziad of Palm Harbor doesn't have much sympathy. "Forty cents, poor people. They're spending $5 or $10 on a cigar. Forty cents is nothing." And besides, he says, higher tobacco taxes might deter people from smoking. That's what public health advocates are counting on.